Victoria Pridemore, the associate director of military and veterans student services, decided to step down earlier this month and officially left her post last week, a University spokeswoman said Monday. Updated: Nov. 27, 2017 at 9:15 p.m.
A top veterans affairs official at the University has resigned. Victoria Pridemore, the associate director of military and veterans student services, decided to step down earlier this month and officially left her post last week, University spokeswoman Lindsay Hamilton said Monday. Officials did not previously announce her resignation. Hamilton said there is no interim associate director and that staff in the Office of Military and Veteran Student Services are “handling the assigned duties to ensure the continuity of services.” Andrew Sonn has been serving as director of the office since May. Pridemore is at least the third staff member to leave the Office of Military and Veterans Affairs in the last year. Departures from the office have raised concerns among student veterans about the future of veterans programs. 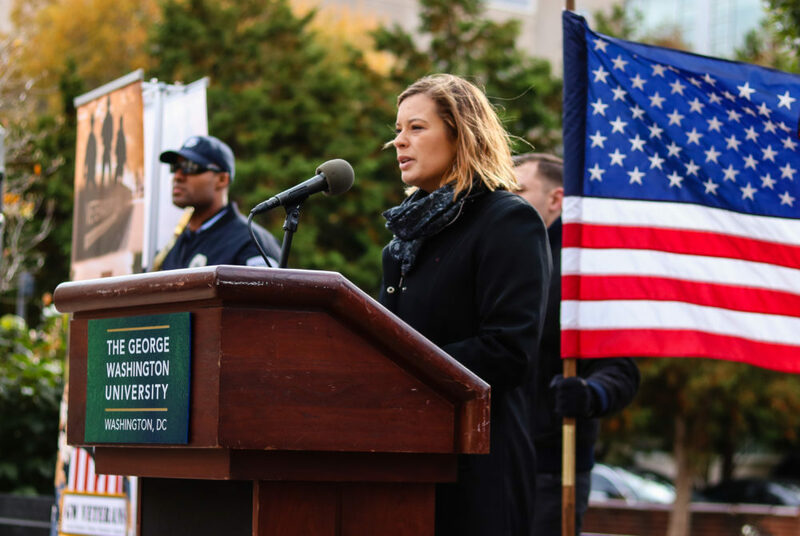 GW Veterans, a student-run advocacy group, announced Pridemore’s departure in a Facebook post Sunday, which included a statement from Pridemore to the GW veteran community in which she said that it was with a “heavy heart and mixed emotions” that she decided to step down. She added that she will remain at GW as a graduate student in the School of Business. Pridemore did not immediately return a request for comment. In the post, GW Veterans said the group was “saddened” by Pridemore’s departure and thanked her for her work with current and former student service members. “She has accomplished so much for GW’s military community and we are excited to see what the future holds for her,” the group wrote in a statement. Pridemore came to the University in 2014 to replace the former associate director Mike Ruybal. She took a leave of absence from her post beginning in October 2016 after being called up for active-duty military service. She returned to campus this fall. During her tenure, Pridemore oversaw GW’s veterans’ services program, which received a national award in 2015. Last year the University increased funding for the Yellow Ribbon Program, which provides funding to student veterans for tuition and fees not covered by the G.I. Bill. But in recent months a series of staff exits from the office has alarmed student veterans. Officials announced in September that the University would conduct a review of the office and develop a strategic plan for the future of its operations. The review came after the associate provost for military and veteran affairs position was eliminated and the veterans office moved under the Division of Student Affairs amid staff cuts in 2016. The Hatchet incorrectly referred to Victoria Pridemore as the top veterans affairs official at the University. She is the associate director of the Office of Military and Veteran Student Services. Andrew Sonn has led the office since May. We regret this error.